TV Guide Close-Up for Casals at 88 on CBS – Copyright 1965 Triangle Publications, Inc.
Before DVRs and VCRs, if you weren’t able to watch something on television when it aired, you were pretty much out of luck. Unless, that is, the network decided to repeat it. CBS did just that in March 1965 when it rebroadcast “Casals at 88,” an hour-long special celebrating the 88th birthday of cellist Pablo Casals. As the Close-Up points out, a last-minute scheduling change meant many viewers didn’t see it when it originally aired in December 1964. 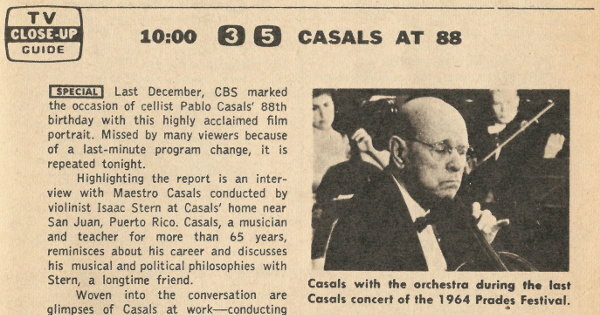 CBS planned to air “Casals at 88” from 7:30-8:30PM ET on Wednesday, December 16th but at the last minute the network decided to air it from 10-11PM ET on Monday, December 14th instead. Presumably, enough people called or wrote to CBS complaining about missing the special that the network decided to rebroadcast it three months later on Monday, March 29th, 1965. This particular Close-Up is from the Eastern New England Edition of TV Guide. Channel 3 was WTIC-TV in Hartford, CT; Channel 5 was WHDH-TV in Boston, MA. TV Guide, March 27th, 1965 (Vol. 13, No. 13), Eastern New England Edition, A-49. Wondering what CBS did aired in that time slot instead when they made that last-minute change. CBS aired Mr. Ed and My Living Doll from 7:30-8:30PM ET on Wednesday, December 16th. Both were shifted from other time slots as part of the network’s mid-season schedule changes. I’m guessing that’s why “Casals at 88” aired two days earlier than originally planned. CBS needed to make some of its scheduling changes quickly. An example of the issues that led to the firing of CBS-TV president James Aubrey a month before this rebroadcast aired. Can you imagine one of the TV networks airing a special about a classical musician in prime time today?